(of a person or their behavior) primarily concerned with making money at the expense of ethics. Kailen’s Twenty, a group of career mercenaries, disbanded over fifteen (15) years ago. Scarred and weary from a lifetime spent thieving, bodies heaving from a consistent dosage of fight brews, the crew now lead their own independent lives. But someone or something is out to end the lives of Kailen’s Twenty, and when a few of the crew are found dead, news spreads to most of the remaining members. It is now a race against the clock to find those members of Kailen’s crew that time has forgotten about, but this killing force will stop at nothing to end. I have to start my main thoughts on this novel with this… I honestly didn’t think I would never finish it, let alone write a review. I started Snakewood three (3) different times, having given up at around 25% and 50% on the first couple of go-rounds. I know that is a weird way to start out a review, but I feel as though I am not the only one who has/had issues with the beginning of this novel [TBH, the 2nd time around was a fail on my part b/c I tried listening at work and it just didn’t jive]. The story is, basically, a series of accounts that have been gathered, put together, and retold by a chronicler named Goran. [If you ever read A Plague of Giants by Kevin Hearne, you know exactly what I’m talking about]. The accounts stick to no exact timeline and the reader is left to put everything in order. We begin things with a first-hand account from Gant, one of the surviving members of Kailen’s Twenty. Names are thrown around, alchemical brews (and their ingredients) that provide an edge in battle are mentioned, and the reader is left to piece everything together. Apparently, you are just supposed to know what all of the terms mean and move on. Good news is: things do end up making sense further down the road. Bad news is: your brain may take time to adjust. Once you get through the first bit of the novel, though, things start to smooth out and the story becomes very engaging. The action is suspenseful, the intrigue palpable, and the ending will make you wish there were more. You probably won’t fall in love with any characters as none of them have any sort of redeeming value, but a handful of them do get fleshed out to the point where you’ll become enamored with their storylines. I did find myself vastly interested in the brew system, which isn’t really magic but chemistry. The brews are not only useful for healing or poisoning, but can give enhanced vision or fighting prowess, be used as traps to incapacitate foes, or to downright murder someone (AVADA KEDAVRA!!!!). This, in addition to hand-to-hand or sword-to-sword combat, make each of the fight scenes worth grabbing a bag of popcorn and snuggling under your comfiest blanket to enjoy. I also loved that, even though you start to uncover who’s who, Selby still injects twists that you won’t see coming. Overall, once I got past the first quarter or so of the novel, I found myself loving Snakewood. I highly recommend any Grimdark fan give it a chance as there really is some fascinating stuff here. 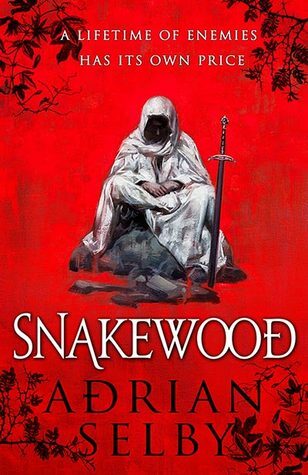 The past few years have certainly produced a number of exciting fantasy debuts and Snakewood, as it should have been, was shortlisted for the Gemmell Morningstar Award in 2017 among a slew of others. ← Red Sister by Mark Lawrence – Mass Market Paperback Giveaway!